The Electric Reliability Council of Texas (ERCOT), grid operator for most of the state of Texas, estimates a reserve margin of 11% for this summer—lower than previous years and ERCOT's 13.75% reference reserve margin—indicating a smaller cushion of resources to meet summer peak demand and an increased risk of grid stress conditions. The lower anticipated reserve margin is mainly a result of three large coal plants retiring in early 2018 and forecasts of record-breaking summer electricity demand. Although ERCOT is only expecting a slightly hotter-than-normal summer overall, abnormally hot stretches of weather in May and June have already set new monthly demand records. 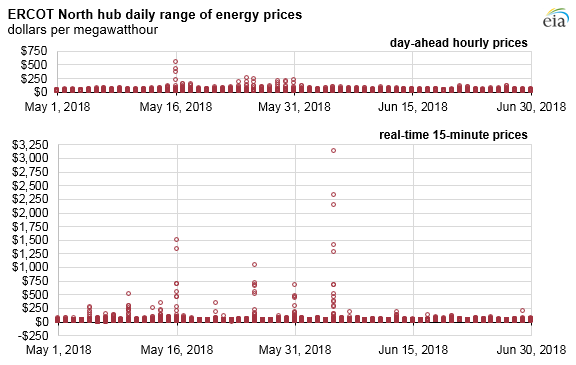 Hourly day-ahead prices at ERCOT's North hub, which represents a region that includes the Dallas-Fort Worth area, reached $551 per megawatthour (MWh) on May 16 and 15-minute real-time prices reached $3,125/MWh on June 5, reflecting the dynamic needs of the grid during these unexpectedly high electricity demand periods. Reserve margins are projections of how much additional or reserve capacity is available beyond the amount needed to meet expected peak loads. These projections usually incorporate conservative estimates of factors such as the expected contribution of wind and solar resources during peak hours and demand reductions from load resources such as demand response programs. ERCOT's final seasonal assessment of the anticipated reserve margin for the summer increased to 11% from earlier projections of 9.3% after a new generator moved up its online date, a mothballed generator became available, and a switchable generator that can choose to connect to either ERCOT or Southwest Power Pool became available to ERCOT. Reserve margin estimates from different sources can vary because of differences in the definitions of factors included in the calculations. 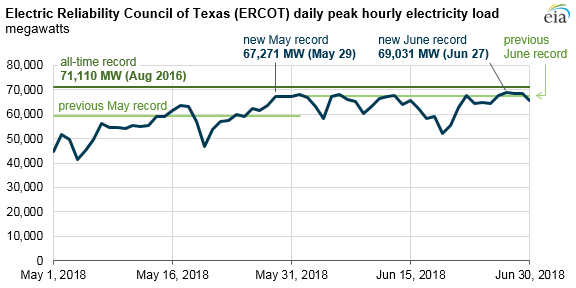 Driven by continued growth of the Texas economy, ERCOT is again predicting record-breaking summer electricity demand, as it has for the past two summers, with a peak load forecast of 72,756 megawatts (MW) based on normal weather conditions. This forecast is more than 1,600 MW higher than the current all-time peak of 71,110 MW set in August 2016. While May 2018 was one of the hottest Mays on record for Texas, leading to a new May demand record that was more than 8,000 MW higher than the previous record, the June-August summer period is only expected to be slightly hotter than normal. Unlike most regional transmission organizations, ERCOT does not have a capacity market. Capacity markets compensate generators and sometimes load resources for providing mainly capacity (and not energy) to the grid, although some capacity markets do have energy-related performance requirements. Consequently, ERCOT relies entirely on its energy market and energy prices to send accurate market signals about the grid's need for additional capacity or generator capabilities and to provide adequate revenues to ERCOT generators because they are not receiving capacity payments. During the high temperatures in May, ERCOT issued several operating condition notices (OCNs) to signal the anticipation of possible emergency conditions; however, the grid operator maintained grid reliability without needing to take any further emergency procedure steps. The May and June price spikes in the day-ahead and real-time markets reflect the dynamically changing conditions of the grid. From day to day and on a real-time (hourly and sub-hourly) basis, the short-term needs of the grid can change quickly and depend on many factors, including the level of demand, the amount of generator outages, and the availability of resources to provide energy, ancillary services, and additional capacity to the grid. Three large coal plants retired in early 2018: the 1,865-MW Monticello plant; the 1,200-MW Sandow (4 & 5) plant; and the 1,208-MW Big Brown plant. These coal plants made up 4,273 MW of generation capacity, about 20% of coal capacity and 4% of total electricity generating capacity in ERCOT at the end of 2017. 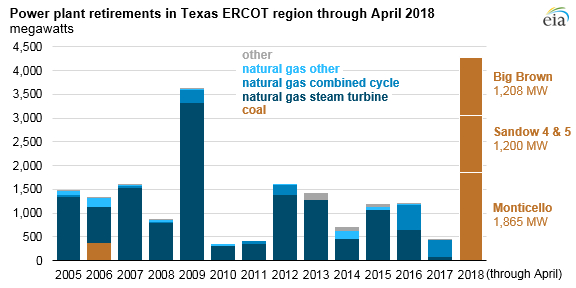 Before these coal plant retirements, most of the recent power plant retirements in ERCOT have been smaller and older natural gas steam plants that were built in the 1950s through 1970s, with some dating as early as the 1920s. The Monticello, Sandow, and Big Brown plants were all built in the 1970s or 1980s with some generating units added or upgraded as recently as 2010.